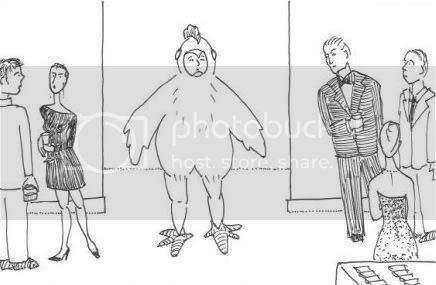 Hahaah... Poor guy in a chicken suit. "Ohh... not that kind of fancy dress party..."
I love how he is now your icon -- woot! I am pleased at the appearance of this new person. I do not miss the new-people-denial system. ntw3001 wrote: I am pleased at the appearance of this new person. I do not miss the new-people-denial system. Oh, dear. Did I miss a hazing or something? You can just tell the other guests think he has a fowl fashion sense, but he'd have been a chicken not to express himself just because they disapprove. Yessir, he has a lot of pluck. I can't imagined how cooped up he feels in such a bulky suit, though. Yeah, but he's not respecting the proper pecking order. That's nothing to crow about.